Is the Garden State now producing rotten tomatoes? 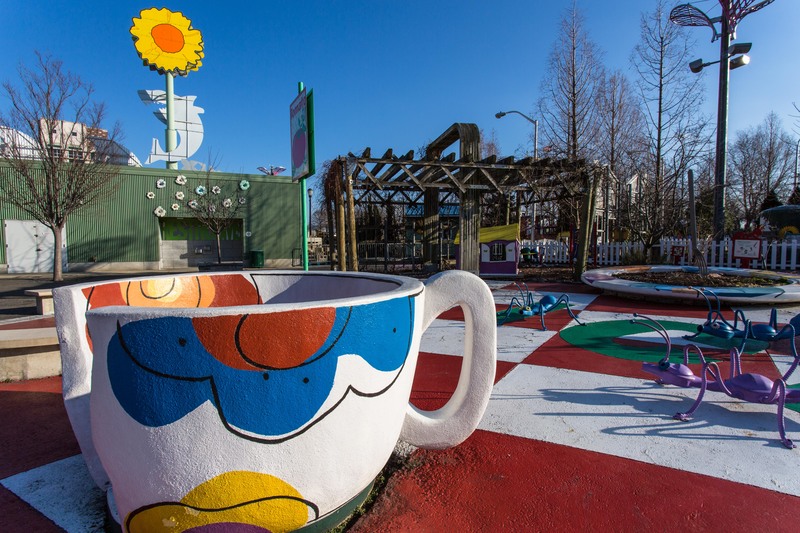 The whimsy of the Camden Children’s Garden. Last month, a government bureaucrat sent a letter to CCG telling them they had until March 31 to get off the land. 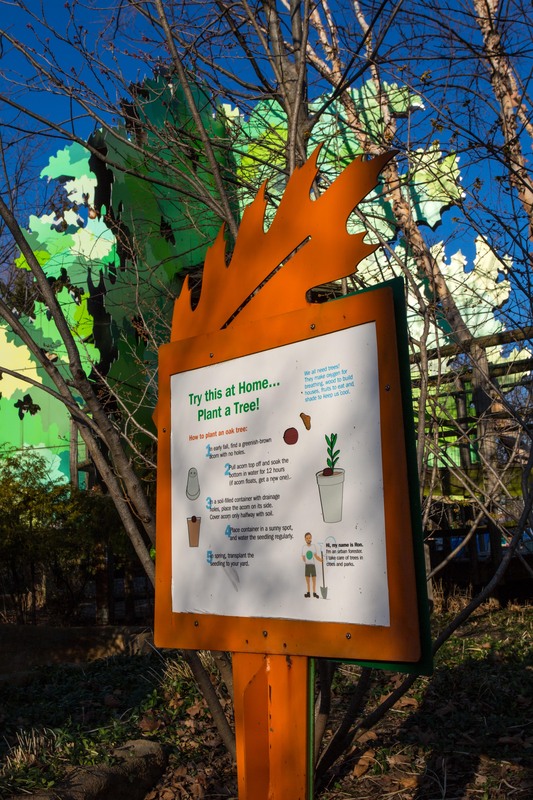 “The State will be proceeding with a plan to enhance the economic development potential of the State-owned property currently home to the Children’s Garden,” wrote Raymond Arcario, Deputy Executive Director of the Division of Property Management and Construction. After 14 successful years operating the CCG on this 4.5 acre site, suddenly the State one day simply decides they have to get out. There is no explanation – only the Orwellian “plan to enhance the economic development potential.” That phrase now hangs in the New Jersey air like a hangman’s noose. There is even a legal dispute about whether the state actually owns the land – it may belong to the city of Camden. Mr. Arcario is a state lackey being told to do this by someone who has political power. No one seems to know who that is, (or is willing to say who it is) and no politician has come forward to take responsibility or to offer any explanation. Welcome to the Garden State, where nowadays the garden gets bulldozed so more asphalt can be laid and more cars and busses can be conveniently parked. 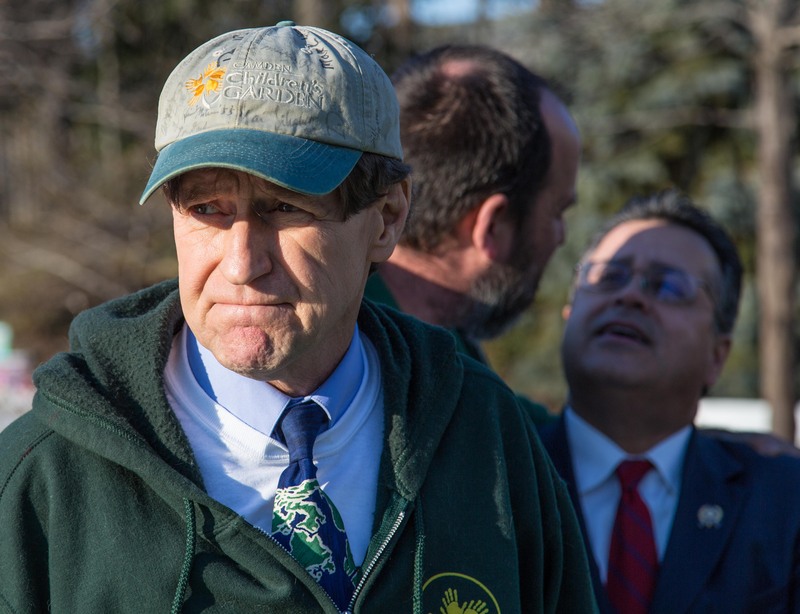 Concern shows in the face of Mike Devlin, leader of the Camden Children’s Garden. Camden is the poorest city in the United States. It consistently ranks as the most dangerous/violent crime-ridden city, not just in the U.S. but in the world. Yet thousands of good and decent people live in the city and try to make an honorable life for themselves and their children. In a place where a child can’t go outside for fear of being caught in a drug dealer shootout, how can the state put them at more risk by taking away the one safe, positive place they have – the one place where they can detox from the stress of constant danger and crushing poverty. I ask, what is this all about? Hearing no answer, I must conclude it is either unfettered lunacy or craven greed. What else could it be? And neither one justifies depriving families and children who have so little to begin with. I think there’s something rotten in the Garden State. Emotions have been roiled over a hostile takeover by the State of New Jersey. 1. A suspect, perhaps fraudulent claim to land they have essentially ignored for at least 14 years. 2. A claim to use the land for “economic development” without telling taxpayers, voters or any other stakeholder what they plan to do. They have said the land will be made available to the tourist attraction next door, a for profit corporation that has already received well over $40 million in state “assistance.” As far as I can tell this corporation pays no taxes, only 50 cents per ticket sold goes to Camden City. 3. 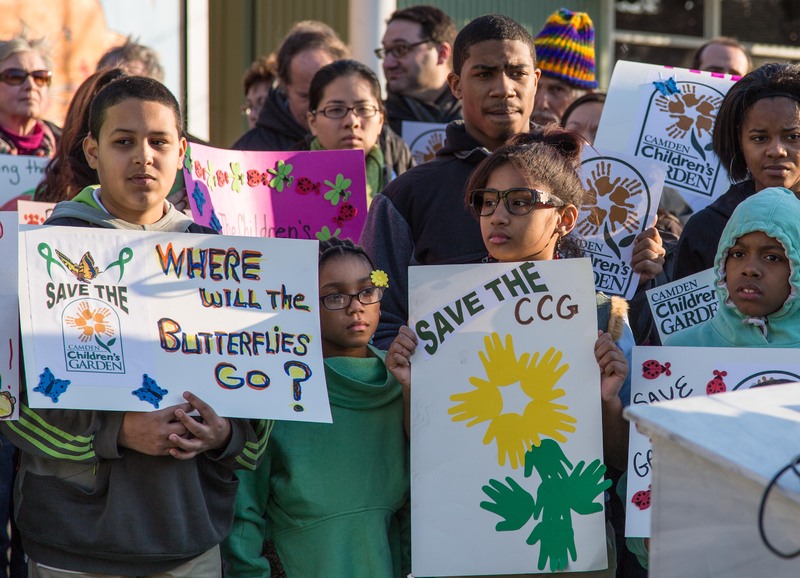 They offer to allow CCG to retain 10% of the land for an office – an office for a “children’s garden” with no garden. The educational nature of a walk in the Garden. 1. An astonishing 14-year track record of benefit to the neediest city in the state. 2. Annually, CCG enables production of over $2 million of fresh, locally grown produce for Camden families in what is considered a “food desert” because there are no readily available supermarkets. They support over 100 neighborhood and private gardens. 3. Since 1999, CCG has put 300 young people through an employment and jobs training program, teaching them how to work and thrive – in addition to giving them direct experience with the natural world and how healthy food is produced. The majority of these youth go on to higher education and good jobs. 5. Michelle Obama celebrated CCG in her 2012 book, American Grown: The Story of the White House Kitchen Garden and Gardens Across America. 6. Over 100,000 visitors enjoy the CCG each year so it’s no small potatoes in the attraction business. CCG leader Mike Devlin told me they provide free admission to over 10,000 children each year for educational programs. They also outreach to Camden schools providing horticultural education and help with school garden projects. 7. CCG is an architectural treasure. Inga Saffron, architecture critic for the Philadelphia Inquirer, wrote, “Designed by the noted architect Steve Izenour, the city landmark celebrates South Jersey in all its wondrous variety: The billboard-style, corrugated-steel entrance gate is a whimsical love note to the region’s truck gardens, seaside kitsch, and roadside signs.” When she pointed that out to state bureaucrats, they had no idea. 9. There’s a LOT more, but I suggest you go to CCG and see for yourself. Just get there before the bulldozers arrive. 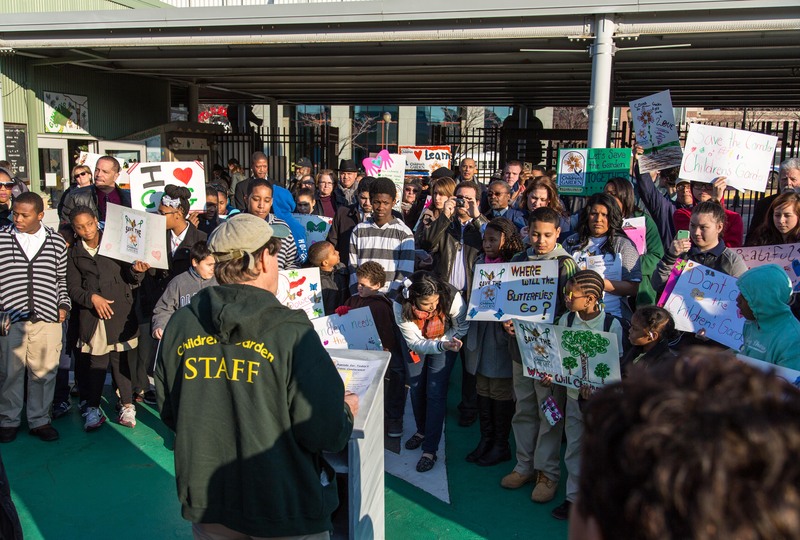 The crowd at a press conference and support rally at the Camden Children’s Garden. Looking at both sides of my scale, I’d say the state comes up woefully short. No surprise there. CCG has a powerful community presence based on good works and a deep spiritual grace that glows bright in the darkness of Camden’s poverty and violence. The State of New Jersey’s behavior reminds me of Richard Nixon campaigning for the presidency in 1968. He had a “secret plan” to end the Vietnam war we were mired in. That’s what he said every time Vietnam came up in any context. Nearly six years later his presidency ended in disgrace – and our Vietnam warring was continuing on. So much for secret plans such as the State of New Jersey has for CCG. Politics has always been a dirty business, especially in both Camden and New Jersey. Speculation as to who is behind this heinous land grab is rife. I hear the owners of that tourist attraction next to CCG are contributors to New Jersey Governor Christopher Christie’s election campaigns (and presidential aspirations, ludicrous as I see them) and turning CCG land over to them is just everyday political payback. Most likely, it has something to do with local political boss, George Norcross III. 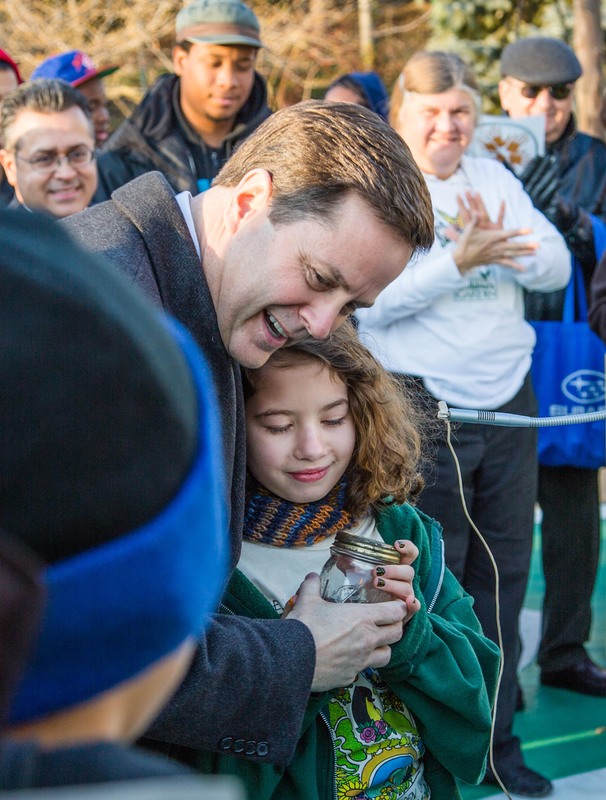 NJ State Senator Donald Norcross accepts a jar of coins saved by a little girl who wants to help save the Camden Children’s Garden. Most local politicians are publicly supporting CCG as it opposes the state’s hostile takeover. At a press conference and support rally last Tuesday (2/12/2013) they were all there at CCG basking in the strong public support for CCG. 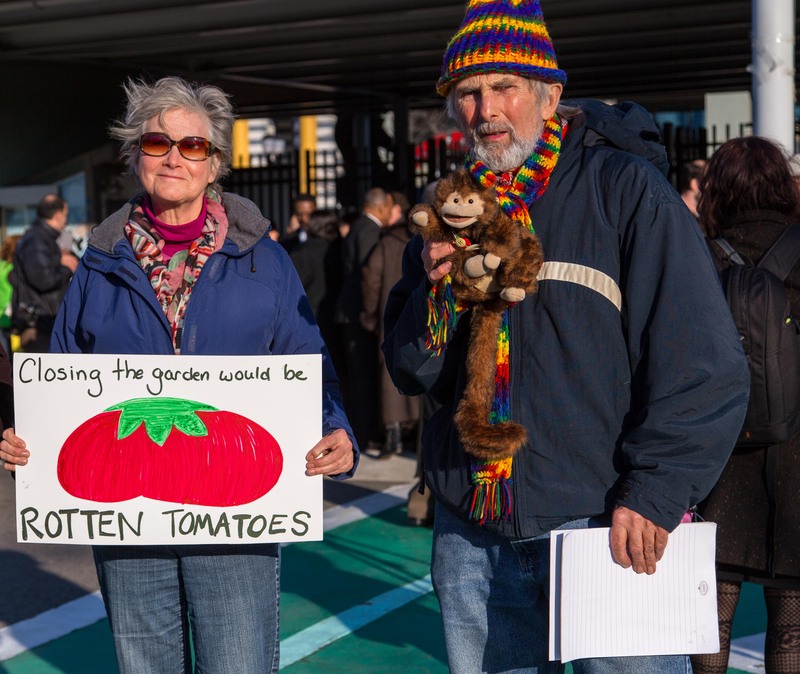 (A Facebook support group instantly sprang up to “save the garden,” and it is now approaching 7000 members.) Regardless the outcome, these politicians can now campaign on having supported CCG. New Jersey State Senator, Donald Norcross (brother of “King George”) was there driving the support bandwagon. To cheers and much applause he made the empty promise that CCG will stay right where it is. Then he made the really big announcement – that he had “brokered” a meeting next week between the State and CCG representatives. To me, all I see is political pandering. And I hope the good people supporting CCG aren’t basing hope for a good outcome on this grandstanding. I think what CCG really needs is a pack of pit bull lawyers tearing at the state’s trousers, so to speak. 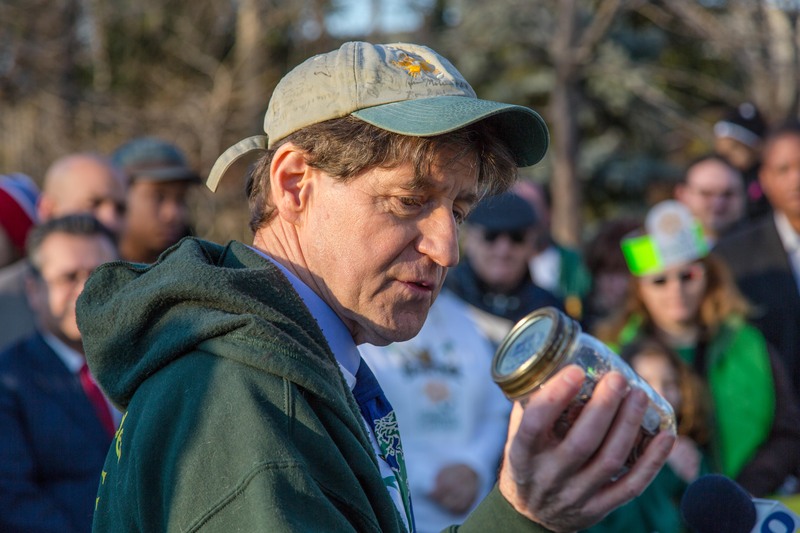 Mike Devlin, leader of the Camden Children’s Garden, seems rather overwhelmed at the jar of coins saved by a child who wants to save the Garden. The dirt at the CCG is good clean dirt that grows food and nurtures the human spirit. The dirt at the State of New Jersey is unclean and weed-infested dirt, the kind that should be cleaned up and recycled into something useful. Aggressive lawyers can sometimes provide such a recycling service. What I want to see is openness and honesty about this. In my dark imaginings, I have a lot of suspicions. What I’d like is for some wholesome sunlight to get in there to balance things out. I want to know who is behind this. I want to know what is planned for this property. I want to know what precipitated this truly hostile takeover attempt. If this were California, whose politics I’m more familiar with, we could put together a ballot initiative and have the citizens of the whole state vote on whether CCG should stay or go. I don’t know if that can be done in New Jersey. 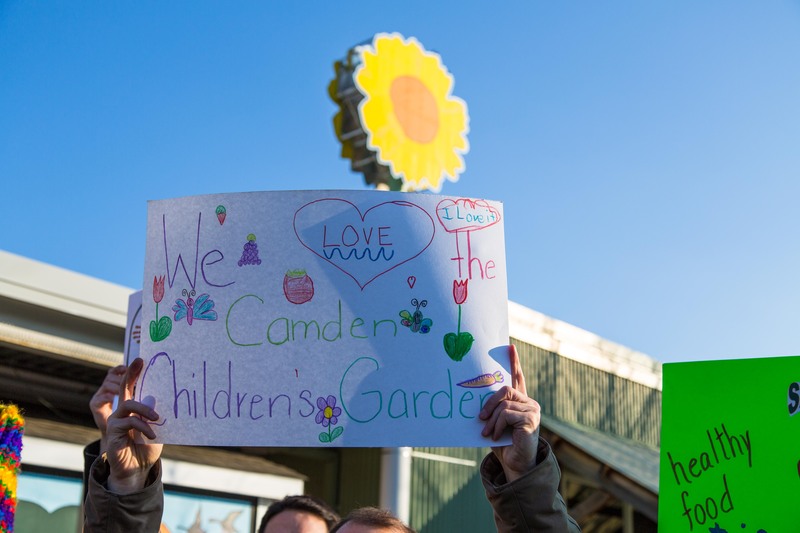 What I do know is that I want the people, not self-serving politicians, to say what happens with CCG – especially the people of Camden and the surrounding communities who reap such a wonderful harvest from CCG. If you have suggestions on how to make these things happen, let me know, and let the CCG support community know. Tell them you want to join in nurturing the spirit of our community. Children don’t want to lose the Garden they’ve come to love. I think you are being unfair. The relatives of the fish in the fish jail (aquarium) need a place to park on Visitor Day.